Alfred Brendel retired from public performances ten years ago, so it was a pleasure to discover two previously unreleased live recordings of music by Schumann and Brahms, broadcast on Austrian radio but only released on disc in March this year. He is joined by the Vienna Philharmonic and Simon Rattle for an exuberant, energetic performance of Schumann’s Piano Concerto, coupled with a poised, intelligent account of Brahms's Variations and Fugue on a Theme by Handel for solo piano. It may perhaps come as something of a surprise to learn that veteran pianist Murray Perahia has not recorded Beethoven’s mighty Hammerklavier sonata before, but after forty years spent reflecting upon this behemoth of the repertoire he felt ready to set his interpretation down on disc. It has certainly been worth the wait, however, as Perahia offers a commanding account of Beethoven’s most challenging work, coupled with a fresh and invigorating performance of the ever-popular Moonlight sonata. In many of his recordings, Alexander Melnikov has often experimented with different pianos, frequently using instruments appropriate to the composer and period. This album sees him taking this to a new level, offering four pieces (by Schubert, Chopin, Liszt, and Stravinsky) performed on four different pianos. The differences made possible by these varying instruments, not only in sound and tone quality but also in interpretation, are quite extraordinary. After highly-praised accounts of piano sonatas by Beethoven and Schubert in recent years, Paul Lewis has turned his attention to the sonatas of Joseph Haydn. Lewis has spoken about his long-standing desire to explore this music, praising the pieces for their wit and invention. It is this humour that he is so good at bringing out in this new recording, coupled with an impressive clarity of attack in the more virtuosic passages, and a wide range of tone colours that brings great beauty to some of the more expressive slow movements. Part musical autobiography, part elegy to a recently departed brother (to borrow a phrase from Beethoven), the Russian-born pianist's Life Album takes death and transfiguration as its theme: on the most literal level, this recital of Bach-via-Busoni and Wagner-via-Liszt focuses on transcriptions, but the idea of transcending suffering through art also resonates throughout the programme. It's as emotionally overwhelming as it is technically immaculate, and displays many of the qualities which made his award-winning 2015 triptych of Variations by Bach, Beethoven and Rzewski so unforgettable. Messiaen has always loomed large in Aimard’s repertoire (his discography includes a Vingt Regards which was described as ‘superb, even awe-inspiring’ by the New York Times, and landmark interpretations of Quatuor pour le fin du temps and Turangalîla); here he begins his exclusive relationship with Pentatone with a work which he describes as ‘a musical refuge that resonates with an audience ever more concerned' with the relationship between man and the natural world. The music of Rachmaninov has formed a significant part of Daniil Trifonov's recorded repertoire, and now he turns his attention to the concertos: this album pairs the Fourth Concerto with perhaps that most famous of all piano concertos, namely the Second. Trifonov brings his customary thoughtfulness and virtuosity to these performances, and both he and Nézet-Séguin avoid any hint of self-indulgence, focusing on the enormous amount of detail present not just in the piano part but also in Rachmaninov’s orchestral writing. Following his award-winning accounts of the Piano Sonata and Preludes, Steven Osborne brings his eloquent, introspective brand of pianism to the two set of ‘study-pictures’ which Rachmaninov composed in 1911 and 1916/17 in interpretations which marry lightly-worn technical prowess with imaginative subtlety. The five études for which the composer retrospectively provided a narrative come across with the same vivid sense of atmosphere which made his 2013 recording of Mussorgsky’s Pictures at an Exhibition such a resounding success. This album is the first instalment of a projected series of Domenico Scarlatti's keyboard sonatas from the young Italian pianist Federico Colli, who took first prize at the Leeds International Piano Competition five years ago. It's a bold, inquisitive exploration which plays up the radical qualities of the music to fascinating effect, using a wide dynamic and tonal palette as well as liberal lashings of rubato and ornamentation to showcase Scarlatti's infinite variety and harmonic adventurousness. Two titans of the keyboard join forces for Stravinsky’s own arrangement of The Rite for two pianos, plus the Concerto for two pianos from the mid-1930s, and transcriptions of Madrid (by the composer's son Soulima), Tango and Circus Polka (by Victor Babin). Awarded Recording of the Month by Gramophone, they praised Hamelin and Andsnes's 'breathtaking pianism'. 22 discs of live recordings made at the Swiss festival between 2002 and 2016; Argerich’s guests include Renaud and Gautier Capuçon, Gidon Kremer, and fellow pianists Stephen Kovacevich, Nelson Goerner, Maria João Pires and Piotr Anderszewski. Featured composers include Mozart, Bartók, Shostakovich, Ravel, Prokofiev, Rachmaninov, Janáček and Lutosławski. This limited edition 41-CD box set compiles Alicia de Larrocha's complete Decca and American Decca recordings. Highlights include her landmark recordings of Spanish piano repertoire - Falla’s Nights in the Gardens of Spain, Albéniz’s Ibéria, and Granados’s Goyescas - as well as previously unreleased accounts of works by Grieg and Albéniz. The collection includes concerto recordings alongside André Previn, Sir Georg Solti, Riccardo Chailly and Zubin Mehta, as well as solo works by Bach, Schumann, Mozart and many more. 15 CDs exploring the development of the piano concerto in Russia in the late nineteenth and early twentieth centuries, from well-known warhorses by Tchaikovsky and Rachmaninov to rarities by Lyapunov, Medtner, Arensky, Kabalevsky, Glazunov and Balakirev. Soloists include Boris Giltburg (in the Shostakovich concertos, with Vasily Petrenko and the Liverpool Philharmonic). This collection of specially commissioned essays offers an accessible introduction to the history of the piano, performance styles and its vast repertoire. Divided into two parts, part one covers the evolution of the piano, from its earliest forms to the most recent developments. Part two explores the widely varied repertoire for the instrument, including contemporary music and a final chapter on jazz, blues and ragtime. A valuable source for pianists, students and enthusiasts. Aimed at everyone with an interest in pianos, this volume in the popular Haynes Manuals series is a thorough but highly readable technical guide to this fascinating instrument. With sections on choosing a piano, care and maintenance, and repairs and tuning this innovative handbook is the perfect addition to every pianist's library. This encyclopedia offers information about everything from the acoustics and construction of the piano to the history of the companies that have built them, and the prominent musicians who have written for, or performed on, the piano. A fascinating yet user-friendly reference guide. This compendium from the archives of renowned piano maker Steinway & Sons encompasses reference material from 160 years of piano making. Kehl and Kirkland bring Steinway's production history to light with precision. The book includes a 'family tree' with in-depth historical listings of each model and their characteristic details, as well as highlights of important changes and events in Steinway production. An indispensable tool for piano technicians, dealers and Steinway owners. Written for both players and listeners, Kenneth Hamilton's highly readable book engagingly and lucidly dissects the oft-invoked myth of a Great Tradition, or Golden Age of Pianism. He discusses in meticulous yet lively detail the performance-style of great pianists from Liszt to Paderewski, and delves into the far-from inevitable development of the piano recital. Readers will find food for thought on repertoire choices, traditions of performance, and the changing role of the audience: 'a delightful and instructive book' (Charles Rosen). Containing numerous profiles of the world's best-known concert pianists, David Dubal's The Art of the Piano is an essential companion for piano aficionados. Each profile features information about the artist's essential repertoire and recordings, plus the guide contains a CD featuring rare performances. 'For all those interested in the piano, this book will provide great insight and knowledge' (Vladimir Horowitz). This study illuminates the piano music of four major French composers, balancing accessibility with scholarly and analytic rigour. Howat explores the musical language and artistic ethos of this repertoire, juxtaposing structural analysis with editorial and performing issues. An essential resource for scholars and performers. Born in 1888, Heinrich Neuhaus was a teacher at the Moscow Conservatoire from 1922; among his pupils were Radu Lupu, Emil Gilels and Sviatoslav Richter. This book, translated by K A Leibovitch, includes sections on tone, technique, and rhythm alongside more general thoughts on performance and attitude, and is widely regarded by teachers around the world as the most authoritative book on the subject of piano playing. Benser explores the kaleidoscopic world of twenty-first-century pianism through a series of extended interviews with eight major pianists: Leif Ove Andsnes, Jonathan Biss, Simone Dinnerstein, Marc-André Hamelin, Stephen Hough, Steven Osborne, Yevgeny Sudbin, and Yuja Wang. They talk with Benser about their first experiences at the piano, the critical role played by their earliest teachers, the literature they play, the instruments they prefer, the meaning of musicianship to them, and the joys and difficulties of a professional career doing what they love. A founder member and pianist with both the Domus and Florestan Trios, Susan Tomes performing life has been centred on chamber music. This book combines a series of diaries describing her travels and performances with a collection of thought-provoking essays about teachers, making records, practising and rehearsing, and the particular challenges of being a concert pianist.This book 'gives you an intensely illuminating picture of the life of a pianist' (James Jolly, Gramophone). This remarkable book allows us to share the thoughts, musical insights, and experience of some of the world's greatest pianists. In 28 separate interviews these legendary artists, including Busoni, Rachmaninov, Paderewski, Grainger and Godowsky, talk about piano technique, musical development, and what is required to achieve virtuoso piano artistry among many other topics. In this eloquent, intimate exploration of the delights and demands of the piano, Charles Rosen draws on a lifetime's wisdom to consider every aspect of the instrument: from what makes a beautiful sound to suffering from stage fright, from the physical challenges of playing to tales of great musicians - including Vladimir Horowitz's recording tricks, Rachmaninov's hands and why Artur Rubenstein applied hairspray to the keys. A graceful blend of anecdote, history, expertise and memoir. This comprehensive introduction to the piano is not unlike having a conversation with a wise and experienced master. Louis Kentner gives all manner of advice, tips and expert inside information, discussing the aspects of piano technique in an orchestral, ensemble and solo context as well as examining its place in history. An interesting, informing and inspiring guide for pianists and piano enthusiasts of all levels. An essential collection of the greatest Christmas songs and carols, specially arranged for solo piano and suitable for the intermediate pianist. This beautiful anthology includes favourites such as O Holy Night, Sleigh Ride and It’s Beginning To Look A Lot Like Christmas alongside arrangements of 'Winter' (from the Four Seasons), 'Troika' (from Lieutenant Kije), and more. This collected study score edition presents Bach's complete clavier music in four large volumes, containing the definitive Urtext from the New Bach Edition. Prepared by internationally recognised scholars on the basis of all known sources, and the latest research findings, the set contains not only the familiar versions of these works but widely divergent variants from Bach's immediate circle. An indispensable, reliable edition for admirers of Bach's clavier music. ABRSM's critical edition of Beethoven's complete piano sonatas, by renowned specialist Barry Cooper, has been created for today's performers, teachers and scholars alike. The most comprehensive study of these extraordinary works yet undertaken, all three volumes are now available in a slipcase box edition. 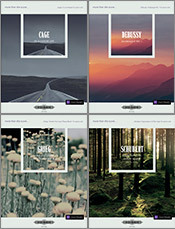 ABRSM's prolific Signature Series includes albums and collections alongside single works. From the complete Beethoven piano sonatas to Bach's Well-Tempered Clavier, and works by composers including Mozart, Chopin, Mendelssohn, and John Field the series encompasses a wide range of piano repertoire. Every album includes an informative introduction and performance notes, making these essential editions for performers of all ages and standards. 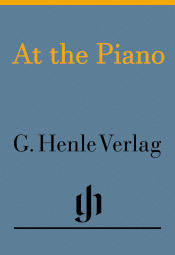 Henle's At the Piano series is an ideal introduction to the world of classical piano music. Each volume focuses on original pieces by one composer, organised in progressive order of difficulty starting with the easier pieces first. 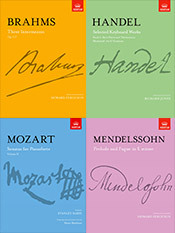 Each work contains detailed fingerings and practical tips on technique and interpretation; the pieces are clearly engraved in Henle's easy-to-read style. The series includes volumes of pieces by Bach, Beethoven, Chopin, Debussy, Mozart and Schubert, among others. Available in English and German language versions. 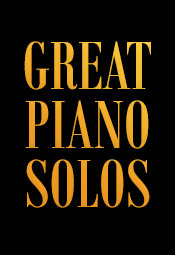 The Great Piano Solos series is perfect for the intermediate pianist. With separate books dedicated to music from film and TV, Christmas songs, Classical music and showtunes as well as numerous volumes combining popular favourites from a wide range of genres the series includes something for everyone. Four additional easy piano volumes contain arrangements of a fantastic selection of tunes for players at around grades 1-3 standard. Peters Edition's More than the score... series covers much of the essential piano repertoire, from Bach through Mozart, Schubert, Chopin and Debussy, through to John Cage. Each volume focuses on one piece, and features written masterclasses and background information from renowned pianists, encouraging an exploration of the music beyond the printed score.